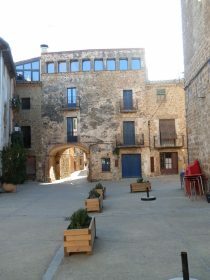 Well connected to the principal localities of the Empordà, Rupià, 66 metres above sea level (1), and with nearly 250 inhabitants (2), is one of the smallest villages of the region of the Baix Empordà. Declared a Historic-Artistic Grouping by the Generalitat de Catalunya (the Catalan autonomous government) (3), Rupià is as surprising as it is little known. Both the urban centre as much as the surrounding area offer singular spaces well worth a visit: here, history, nature and culture go hand in hand. An ancient domain of the bishopric of Girona, Rupià contains remains from the Middle Ages such as the castle (in a civil gothic style) or the walls (15th century) encircling the historic centre, which has a typically medieval outline. Nearby, the Mas Llorà shows what an 18th century manor house was like. In the surroundings of Rupià one also finds the Great Olive Tree of Mas Llorà, a very large millennial tree, immortalized by Josep Pla in several of his texts and baptised as the “prodigious olive tree”. As with the other towns and villages of the Empordà, the cuisine of Rupià is characterised by a wealth of tastes, colours and textures, found in fish and seafood (from the Costa Brava), products from the vegetable garden, meats and dairy products. A wide range of restaurants in the area demonstrate that the region’s identity essentially passes through its gastronomy. Information on the value of your property. Obtain completely free the energy rating of your house.